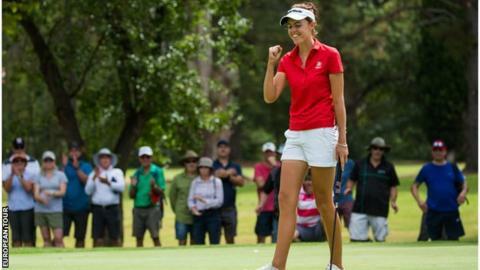 England's Meghan MacLaren clinched a second successive Women's New South Wales Open title with a three-stroke victory at Queanbeyan Golf Club. The 24-year-old, joint leader going into the final day, closed with a round of 69 to finish 12 under par. MacLaren made a third birdie putt of the day on the 18th to clinch the win three shots ahead of Munchin Keh of New Zealand and Lynn Carlsson of Sweden. England's Felicity Johnson shot a 69 to finish tied for fifth. "Last year was my first win, so that was a pretty big deal and I don't think anything can compare to that," said MacLaren. "But you don't want to be a one-win wonder. There was a bit more pressure this week, to come through that feels amazing."